Now that you know how beer is made, let’s get started with the list of things you will need to brew your own beer. But before that, let me answer one question: is it really simple? Well. Yes & No. Yes because the steps are indeed what I outlined in my previous post (perhaps a couple more). No because making beer is just like cooking. Many people can cook but can they make really good food? The crux of it is that it is simple but you need practise & experience. You need to brew over and over again and make sure you pay attention to details. And don’t forget: do everything I tell you to do. I have made tons of mistakes & have learned a lot. You will make mistakes too & learn from them but why make the mistakes I made? Huh? Without spending you aren’t going to get anywhere. It will cost you at least Rs.15000 and trust me, once you decide to spend this much and start making beer on your own, you will have a great time. Not to mention, nearly free beer! The money is not for me or for use of this site. It is for the equipment. 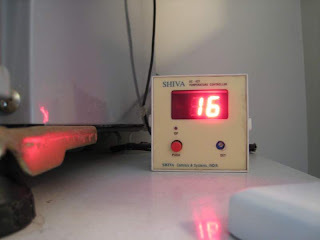 During fermentation, it is extemely important to control the temperature. Beers usually ferment at 20 Celcius or below. If the temperature rises above 20 Celcius, the off-flavors and by-products the yeast produce cannot be removed. You can control the temperature by using a bath-tub, ice bag etc., but I wouldn't advise that. 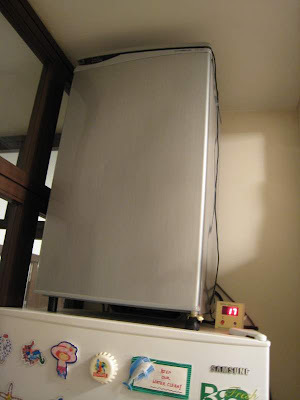 A mini- fridge (larger if you want) that has a temperature controller on it is a must. You will use this to put your fermentor bottle, jar, vessel that holds the green beer (cooled wort + yeast) for the fermentation process. This is perhaps the most important equipment and also the most expensive. It will cost you about Rs.6000. Cheaper if you buy a used one or rig the one you already have in your bar. Check out the fridge I have at home. It is placed on top of the normal fridge. Notice the temperature controller as well. In Mumbai, you could get the temp controller from the electronics market at Lohar Chawl (about Rs.800-1000), ask your electrician or contact Amar Reddy at +91 9821628879. His company makes these controllers and he is really a very nice person. The mini-fride is available at any white goods store. A couple of things you must keep in mind before you go and buy the mini-fridge: Look for one that has least number of shelves and/or compartments & make sure that your fermentor bottle, jar, vessel fits in it properly with some free head room still available. This should be simple. At some point in our lives, we have used a thermometer. Haven't we? By the way, I am not talking about the medical one we use to measure body temperature! Get the kind that lets you measure on a scale of 0 to 100 Celcius. Perhaps get two because these things will break and you don't want to be stuck brewing without a thermometer. You will need the thermometer to check and set temperature during the brewing processes. This will cost you about Rs.200. In Mumbai, you can get it from laboratory equipment shops (there are 100s) at Princess Street. An hydrometer is an instrument that measures specific gravity of a liquid. The specific gravity of water is 1.000. Along with the hydrometer you will need to get a measuring cylinder as well. Don't worry if this seems like rocket science to you right now. I will cover using the hydrometer in later posts. Just keep in mind that the hydrometer should be calliberated such that you can easily take readings over 1.000. You really don't need to take readings below 1.000. These two things should cost you about Rs.300. In Mumbai, you can get it from laboratory equipment shops (there are 100s) at Princess Street. There is another product that does the same thing a hydrometer does. 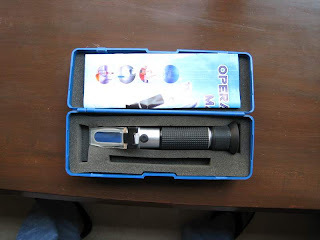 It is called a refractometer. It costs about 60 USD (Rs.2400) from a site called Northern Brewer and if you can get someone from the US to carry it for you, its worth every cent. If not, don't worry. You can use the good-old-hydrometer just as many breweries do and still make good beer. Very important to get one that accurately measures the weight of the ingredients. 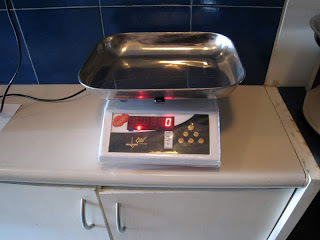 You will need one that can weigh at least 500 grams at one time. It has to have some level of precision because if the margin of error is high, you will end up making mistakes in weighing malt, hops or yeast. A bit of extra or less malt may not impact your beer but if you add excess hops (I have done this and the beer I made was extremely bitter & harsh) or excess yeast, it could be detrimental to your beer. A decent one will cost about Rs.3000. You will need one to aerate the wort before pitching yeast. It's ok if you don't understand the process now but a simple acquarium pump may be essential. I say may be because so far I haven't used one and my beers are good. However, I have just started experimenting. Read about it & then decide. Shouldn't cost you more than Rs.1000. BTW, you will need some tubing as well. This comes with the pump but you will need to get a filter through which the air passes and gets sanitized. I couldn't find it in Mumbai (although I didn't try much) so I bought one from Northern Brewer. This should be easy. All you need to do is get permission from your mother / wife. Use the small attachments that come with most mixers / grinders. The process here involves crushing the grain / malt so that you can extract all the goodness that gets converted into beer! pH is a measure of the acidity or alkalinity of a solution. This is important during the mashing process (mixing of crushed malt/grain in hot water using a mash tun). You can get pH papers for Rs.100 - Rs.200. The range you are looking for would be between 4 - 9. The smaller the units in between 4 & 9, the better. So, it could mean pH paper with readings of 4, 4.3, 4.6 & so on all the way to 9. Some other variant would also suffice. The main goal is to determine the pH of your mash with an accuracy of +/- 0.1 unit. These papers are relatively easy to use. Just dip the strip in the solution or put a couple of drops on the strip. The color will change to indicate the pH of your solution. That's it. hi great post. I have made ginger ale at home. now i want to make beer. Is there any place in Delhi, where i get the equipment. Hey. I m very much interested in home brewing. I have made couple batches with my cousin in US. But now I would like to continue brewing in India. Can you tell me where can I find all the equipments and ingredients? Want part II? Get in touch with me on IBGMumbai at Gmail dot com.